A few weeks ago Gary Taylor, who was awarded the British North West Hairdresser of the year 2015, came into the salon to do a men's cutting course. 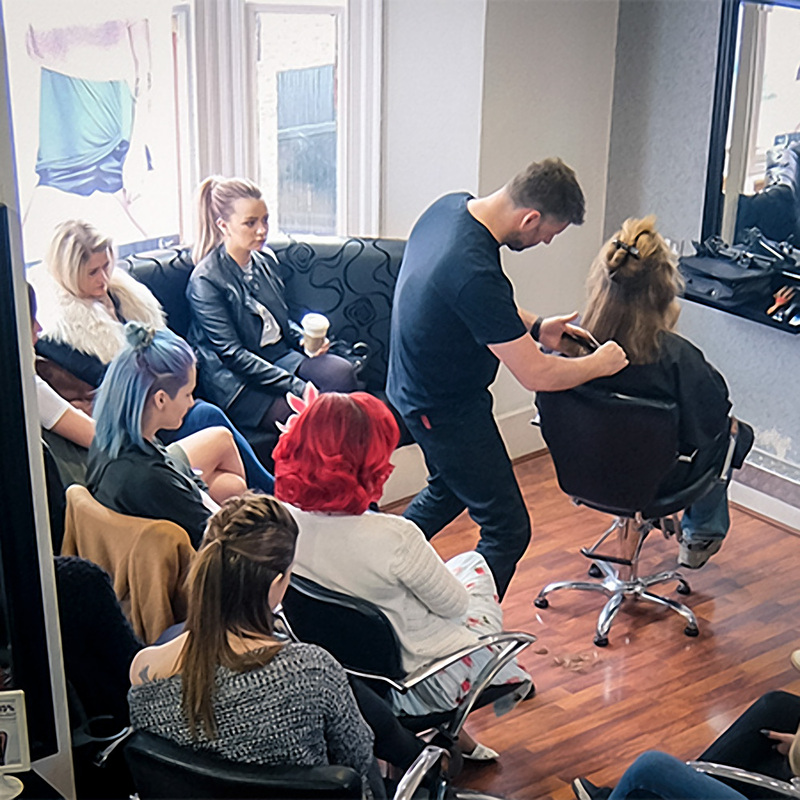 We had our colleagues from Paul Kemp Hairdressing join us for the training session too. Gary was a lovely guy with a great personality, we all got on really well with him. He told us that he is from Halifax, comes from a long line of hairdressers and in 2019 his hair salon will be 100 years old! In the morning session Gary did 3 models, one long hair and two short hair.The first model had long hair past his shoulders, Gary took it up to his shoulders, layered and shaped it so it was structured but still looking masculine. He gave lots of hints and tips on how to cut and style long hair on men and keep it masculine. For example leaving the hair slightly damp after blow drying so as it dries naturally it keeps the movement natural of their hair. The second model was a short cut, he showed us two different techniques of cutting the back and sides but achieving the same result. First he showed us with a cut throat razor and a comb, then he cut the other side with the clippers without using any guards. His third model was similar to the second, but on this guys hair he showed us how to do a blend from almost a bare blade to the equivalent length of a number 2 guard. He also left a weight line in his hair and told us how to soften it without completely blending it away. For the afternoon session we all had models in and did at least one person each. Some people did two or three people. Gary walked around and helped everyone decide what technique of cutting to use so we could each try something new that he had demonstrated. I found the training very interesting and enjoyed trying something new. When using the clippers without a guard for the first time was nerve racking, but once I'd got the hang of it the results were really good.